An apple pie-like dessert, baked until golden brown, and topped with a glaze of sugar and lemon. 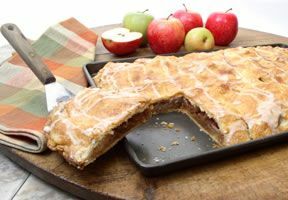 This Apple Pie Bar recipe is a delicious treat for a picnic, or any gathering of friends and family. 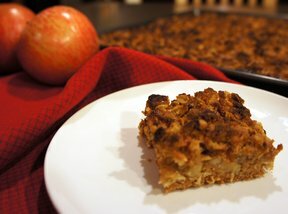 If you like apple pie you are sure to enjoy this apple bar recipe. In a large bowl, combine flour, sugar, salt, and baking soda. Cut-in 1 cup vegetable shortening. Separate the eggs. Place egg yolks in a one cup measuring cup and add milk to the egg yolks until milk and egg yolks equal 2/3 cups. Blend the egg mixture into flour mixture until it reaches a dough consistency. Divide the dough in half. Roll out 1/2 of the dough to fit the bottom of the jelly roll pan. The crust will be very thin. Cover crust with crushed corn flakes. Cover corn flakes with prepared apple slices. In separate bowl, combine sugar and cinnamon. Sprinkle evenly over apple slices. Roll out the remaining dough and cover the apple mixture with it. The dough will be very thin. Beat remaining egg whites until they appear semi-stiff. Brush the crust with the egg whites. Bake for 35 to 40 minutes. Remove from oven. In a small bowl, combine powdered sugar and lemon juice for glaze. Blend until smooth. Adjust consistency (add lemon juice if too dry; add powdered sugar if too runny). Drizzle glaze over the top of the warm bars. Bars can be served warm or cold, and they freeze well, too.